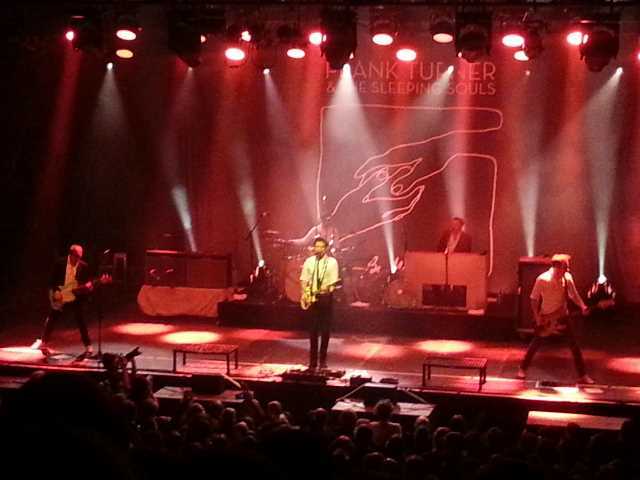 Last year Frank Turner and The Sleeping Souls were in Berlin in January. Unfortunately I was too late, so I didn't get any more tickets. Now - my first time - I ordered in time and they played at the Columbiahalle - a home game for me. Admission was already at 6:30pm - start at 7:30pm, so I had to take a train early from work to be there in time. But during the day I noticed that Frank Turner is supported by 2 other bands, so I didn't have to hurry. Around 8pm I was at the Columbiahalle, where the second support band PUP played. But it was already pretty crowded there. I got myself a beer and went up to the gallery because from there you had a better view to the stage. There I got a wonderful place with a good view to the stage. PUP played another 3 - 4 songs (at one song they had the bright white spotlights pointed directly to the gallery so you had to cover your eyes) before they left the stage at 8:30pm. After a short break for the rebuild they started on time at 9pm with Frank Turner and The Sleeping Souls.